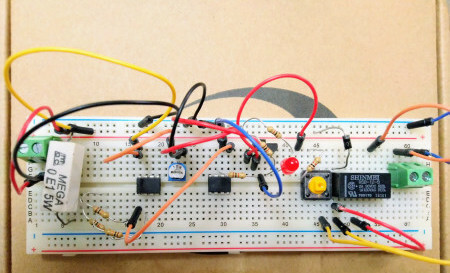 As a beginner in electronics, you're pretty limited when it comes to powering your newly-fabricated circuits. Now, that would not be a problem if you make absolutely no mistakes. But, let's face it that it is a rarity. So, no matter whether you messed up a connection on the output side of your IC or you mix up the polarity of your capacitor something will get destroyed because your power supply will pump out the over-current according to it's set voltage no matter. What one solution to this problem is using a variable bench power supply with a current limit function so that we can prevent a big current flow when an error occurs but those are pretty expensive. Obviously, this is not usable when you create a battery powered project. In this project, I will show you how to create a simple circuit that connects in between your power source and your circuits and will interrupt the current flow whenever a set current limit is reached. This project is sponsored by LCSC. 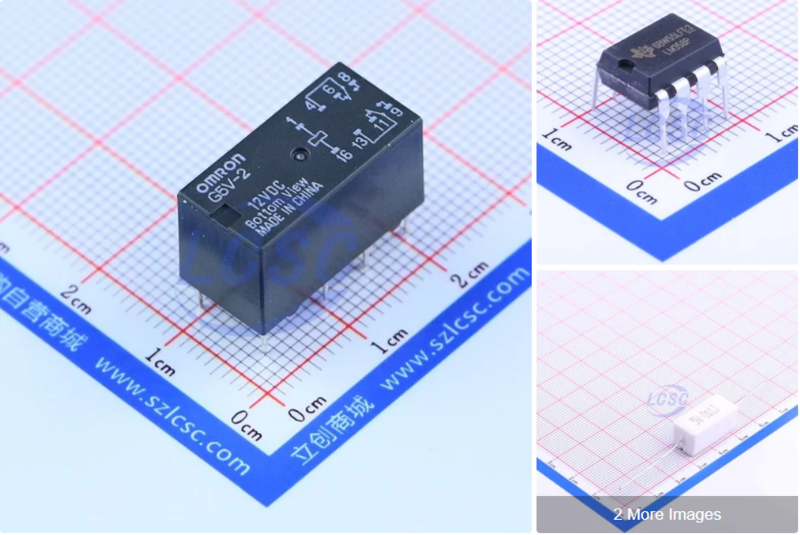 I have been using electronic components from LCSC.com. The first component we need for the circuits is the relay which consists of a coil and to change over contacts that means that when no voltage is applied to the coil. When at least 3.8V is applied to the coil, the contacts open/close. Now, we can use one of the change contacts when there is no over-current and open the contacts when it is over-current. An NPN-transistor is used in series to the coil as well as a 1k Ohms resistor between the supply voltage and the base of the transistor. Now, if the voltage is applied to the circuit, current will flow through the transistor which starts closer to it's the collector-emitter path. Therefore, the coil is energized and the contacts are closed. Of course, we should not forget to add the fly-back diodes to prevent the over-voltages at the collector. To visually see that there is no over-current problem, I prefer to use a green LED with a current limiting resistor. To deactivate the relay if a problem occurs, we can add a second NPN transistor to the base of the first transistor, If an error signal is applied to the base of the second one and thus, the coil would deactivate, the LED would turn off and the contacts would open to detect the over-current. Though we need a low-value power resistor like 0.5 ohms 5-watt resistor. By adding simply adding it in series between the supply voltage and the first relay contacts, it creates a voltage drop proportional to the flowing current but since this voltage drop is rather low, we first have to utilize an Op-Amp in a differential amplification configuration. To get a bigger voltage that we can work with this amplified signal then connects to the non-inverting input of the second op-amp whose inverting input is directly connected to the potentiometer. By tuning the potentiometer, we can create a variable reference voltage and since the op-amp acts as a comparator, it's output will be pulled high if the current sense voltage is higher than the reference voltage. This triggered outputs finally connects to the base of the second transistor through a resistor in the turns of the relay even over-current. Once the relay is no longer activated, the flowing current decreases off the output of the comparator and therefore the relay is once activated. But since the over-current will once again flow when the relay is activated, the comparator triggers once again and the cycle repeats over and over. Again so to fix this we could connect a resistor, a normally closed push-button and other still unused normally closed contact of the relay in series to the base of the second transistor. Now, when a fold occurs, the relay will still turn off but since the normally closed contact of the relay is now obviously closed. The base of the transistor is still pulled to the supply voltage even though the comparator output is put low this way. The relay stays off until the tactile switch is pushed and thus interrupts the base current of the second transistor which therefore allows the relay to be activated once again. So now that we know how the circuit works! 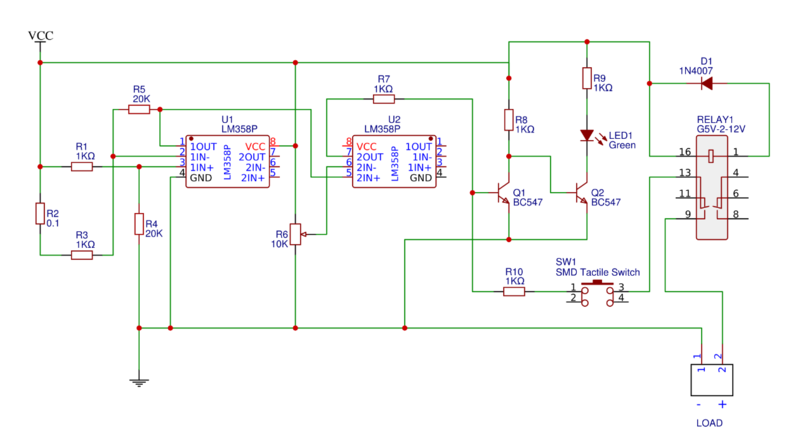 After you connect all the components in the circuit according to the schematics, it's time to start testing and calibrating the circuit. Note: By adjusting the reference voltage incorrectly, these circuits don't interrupt the current flow but once we lower the reference voltage to a suitable value, the circuit interrupts the current without a problem and also easily reactivates by using a push-button.